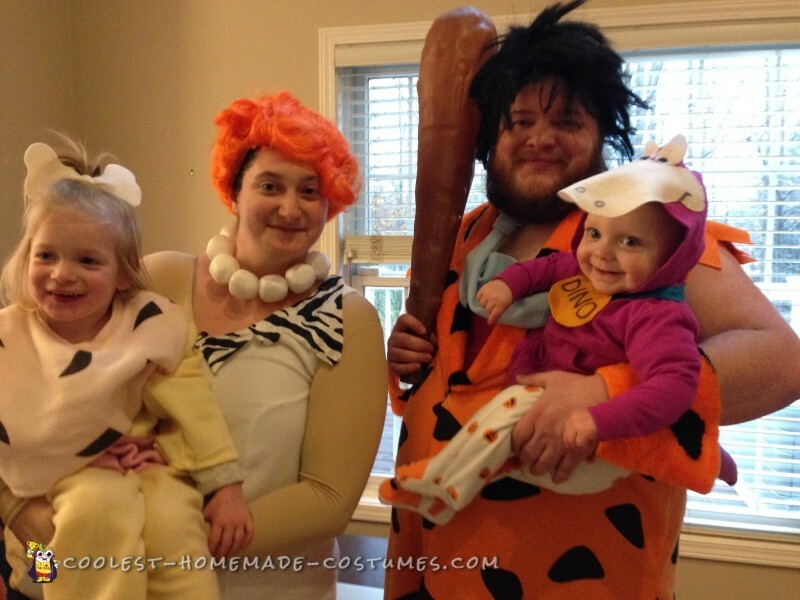 This year, my husband and I decided to dress up as the Flintstones as a family for our annual Halloween party and trick-or-treating. As it was our first year in our new house, we had a lot of other decorations to make for the house and I knew I wouldn’t be able to make costumes for all four of us. So I (horror) decided to buy costumes online. 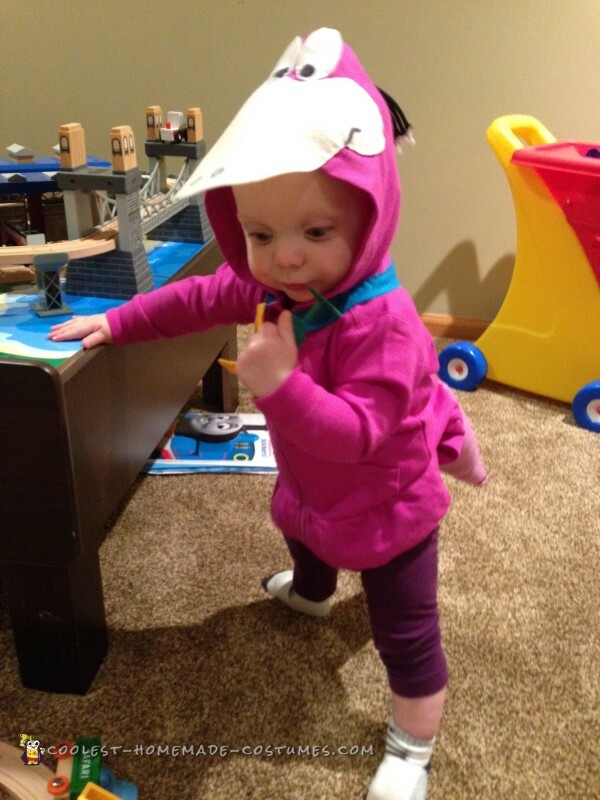 However, I couldn’t find a Dino costume for my 9 month old son. 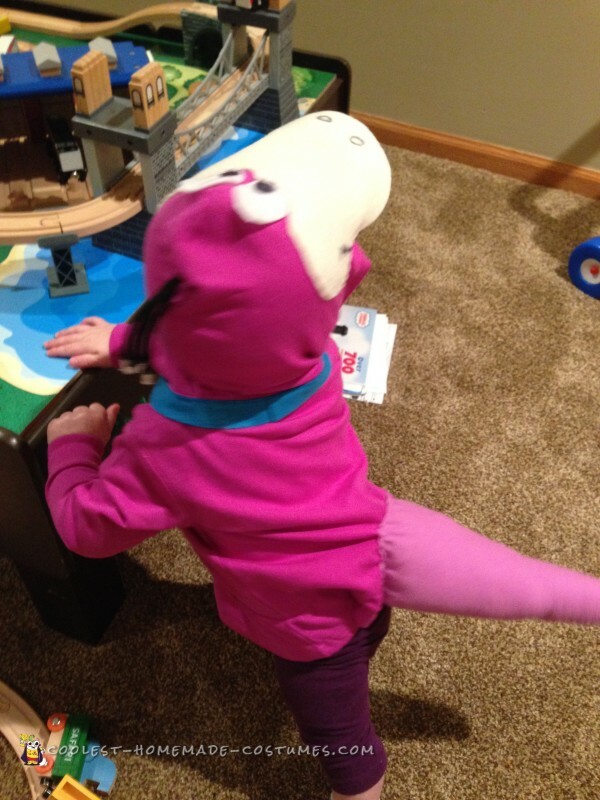 The only options for Dino online were a toddler costume (for a 2-4 year old) or a dog costume – and I was not about to put my son in a dog costume! Instead, I found a baby girl’s hoodie online in the perfect color and also bought felt for the eyes, mouth, collar and tag. I used a still shot from the show as reference as I did the face. I bought some purple fabric for the tail and stuffed it with some pillow stuffing. It was very difficult to find a color match in fabric, so I had to settle for close but not exact. Everything was hand sewn onto the sweatshirt and the black writing, eyes and nostrils are permanent marker. For our party and his daycare party, I put him in a pair of his sister’s leggings, which also were not the same color, but no one cared! 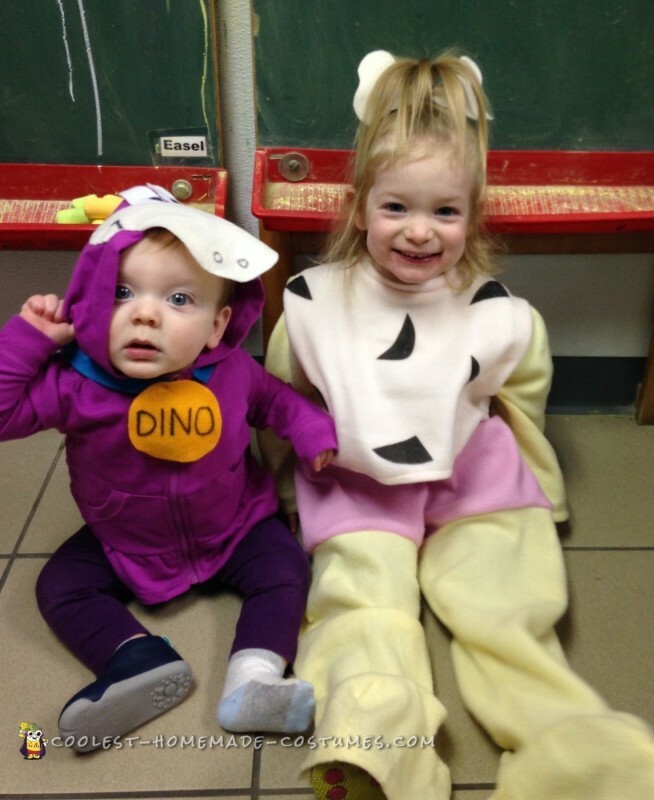 The baby Flintstones Dino costume was perfect because it was not very intrusive to my active boy’s life. 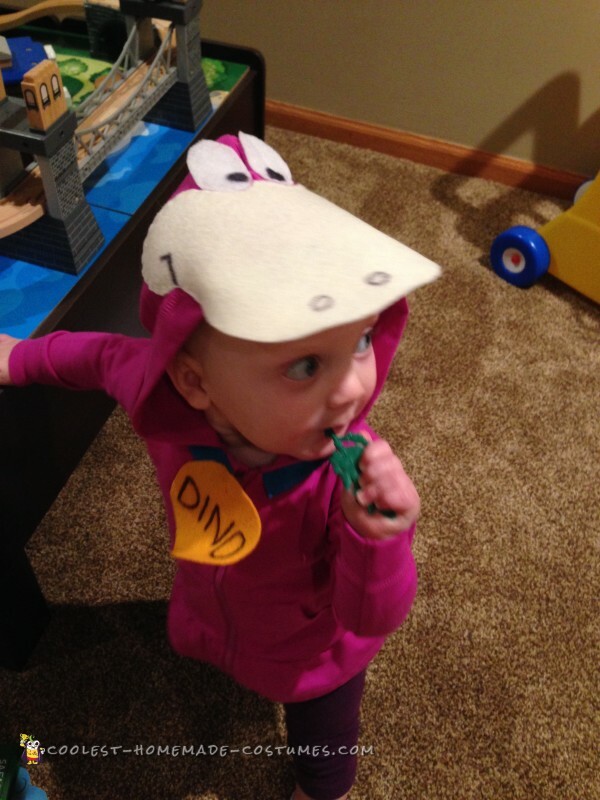 He wore it at daycare for their party – over a onesie. For trick or treating I had his pajamas under the sweatshirt for added warmth. As with typical second child syndrome, I forgot to take a picture of him in the wagon while trick or treating! 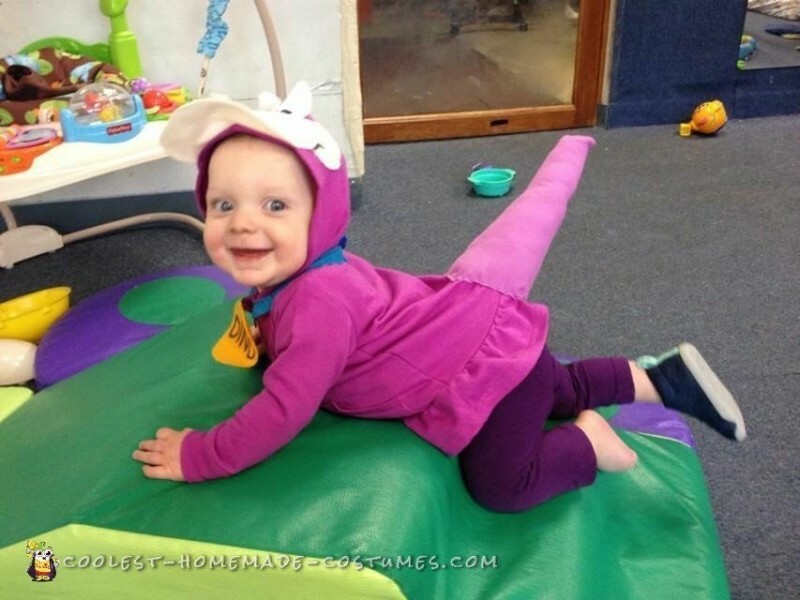 My favorite part of the baby Flintstones Dino costume was how the tail would stick straight up when he was crawling. I wish I had had more time so I could have made all our costumes – but I am very proud of what I was able to do for my son’s first Halloween.